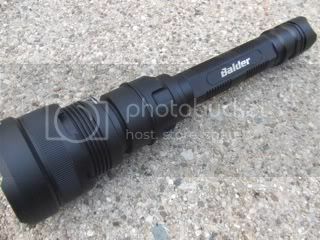 Balder is a new flashlight manufacturer, with lights available in AA, 18650, and 2x18650 sizes. The BD-4 is their largest, most high-powered light currently available. 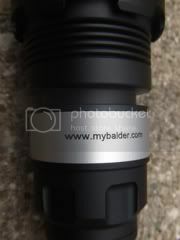 What makes the BD-4 stand out is their use of a U2 binned Cree XM-L emitter, which can be up to 14% brighter than a T6 binned XM-L (the next step down, and most common in high-end lights) according to Cree's website. Thanks to Martin at Balder for providing the BD-4 for review. I’ll be reviewing the BD-4 in two sections: first, I’ll discuss the light objectively (the facts about the light itself), then I’ll discuss the light subjectively (my impressions about the lights performance when used for specific applications. 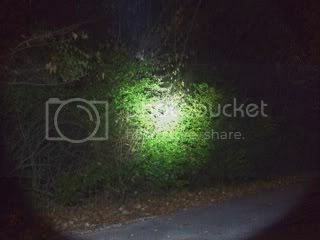 This light is a large light, and I'll be evaluating it as a thrower, a car light, a home security light, and a general outdoor light. If you have any other specific applications you'd like this light evaluated for, feel free to let me know and I'll see what I can do. 1. Powerful beam shot, maximum 900 lumen. 3. 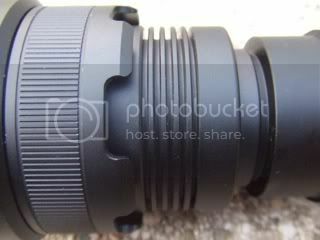 Mil-Spec Type III Hard Anodized finish. 4. Made from Aluminum alloy, really strong. 5. 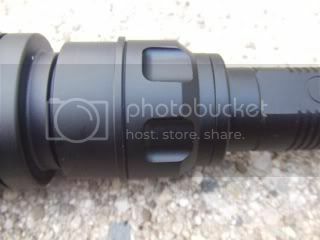 Water proof to IPX-8 standard. 6. 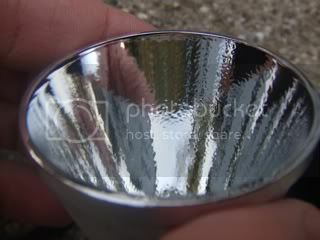 Precision Aluminum reflector (SMO). 7. Simple operation. High-Medium-Low. 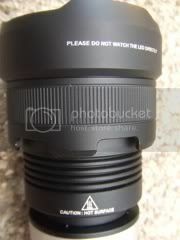 No SOS and strobe modes. 9. Anti-reverse protection and low voltage protection circuit. "Warning:Please do not use cheap protected 18650 battery that do not allow the current over 2A"
As you can see, this is meant to be a pretty intense light. 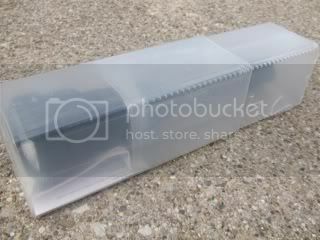 My light came in a cloudy plastic box that slides apart. Mine was slightly damaged on it's voyage from Hong Kong, but I imagine that if you get it from a dealer it will come in better shape. A pretty fun package design though. Included inside are the light, instruction manual, and a small baggie with extra tailcap button boot, a couple of or-rings, and small magnet. Their website lists a lanyard and holster as optional accessories, and they were not included in the review sample sent to me. 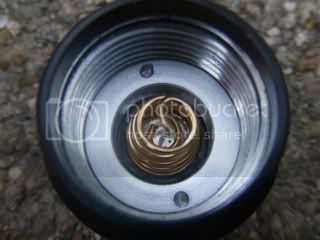 The magnet is included to act as a spacer that can make an electrical connection between two flat-top 18650 cells that wouldn't otherwise be able to be used in series. The light itself is very impressive and agressive-looking. The light feels very solid in your hand. It is fairly weighty, but not so much that carrying it will wear you out. 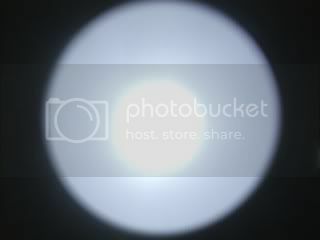 The light doesn't have much printed on it, and what is printed is clear and sharp. 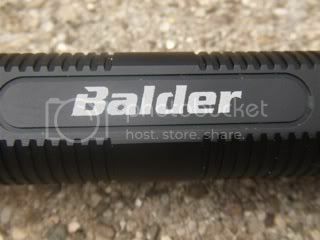 The body of the light had Balder's name/logo on only one side. The head has a heat caution and a warning not to shine it in your eyes printed on it. The head also has a silver band with the name/logo on one side, and their website on the other. "Please do not watch the light directly"
The light can be taken apart into several pieces, without the use of any tools. 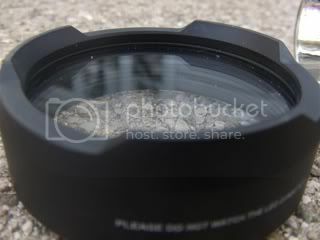 (The lens also comes out of the bezel, I just didn't want to lay it down on bare cement.) Lights that come apart into this many pieces can less sturdy (always feeling like you need to tighten it more), but this light doesn't seem to have that problem. When you have everything put together, it feels solid. The specs claim IPX-8 waterproofness, which can be tough for a light in this many pieces, but it has o-rings in all the appropriate places. As you can see, the silver ring with the Balder logo and website is removable, so if you want to go "stealth" you can take it off. It does not seem to provide any sort of function other than style. The bezel is what I would call "slightly aggressive". It has three protrusions, about 3mm taller than the surrounding valleys. The reflector has a "medium orange peel" (MOP) texture, which makes the beam smoother at the cost of throwing distance. 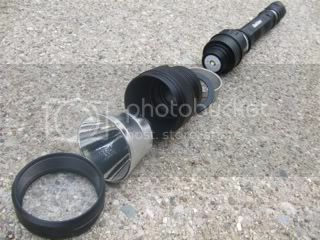 The reflector is very deep, which will help this light throw well. When the head is taken off, it exposes the bare emitter. This means that the light can do a "candle mode" with no reflector, but it also means that the emitter isn't perfectly centered when the reflector is on (because the reflector is removable, it can't be kept perfectly in place). With the head off, a small piece of white plastic gives the circuitry a little extra protection, but it won't be water proof in candle mode. 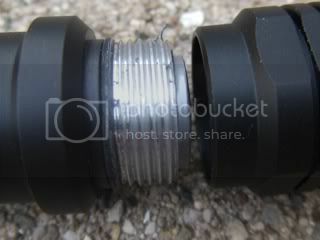 The threads on most of the light are anodized to protect against wear, but the threads on the body are left un-anodized for electrical conduction. 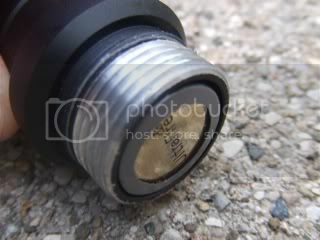 This means that unscrewing the tailcap won't lock out the light, because an electrical connection can be made at any time the threads of the body and tailcap are touching. Also, the threads are not square. 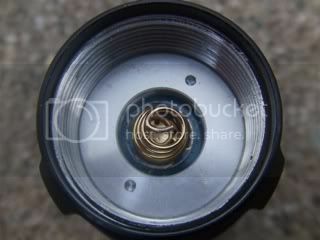 Square threads tend to stand up better to long term use and feel smoother screwing/unscrewing the light. Springs are included on both the positive and negative battery contacts, so that should help prevent damage to circuitry or batteries from impact. 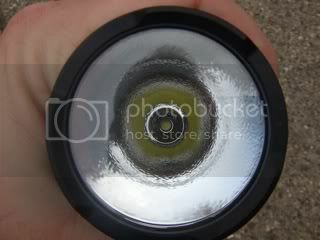 It also gives you wiggle room for the size of your "18650" cells (some are closer to 70 mm than 65). 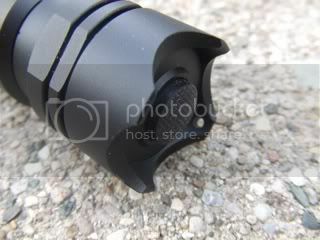 Also, because both the head and tailcap unscrew, you can insert/remove batteries from either end. 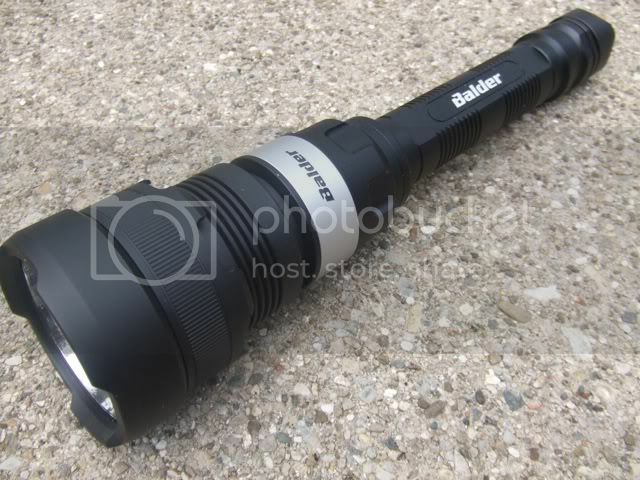 (The instruction manual suggests "screw body off flashlight" to change the batteries. I'm not sure if there is any reason to prefer that over removing the tailcap.) This light has protection against putting the batteries in backwards damaging the light, but if you want it to turn on, you put the positive terminals facing the head of the light. The tailcap has four cutouts, leaving room for your thumb to easily reach the button and still letting the light tail stand. 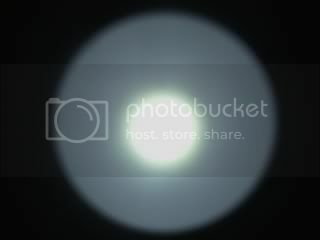 However, when the head is on the light can be a little unstable. With the head off (candle mode) it seems pretty stable. 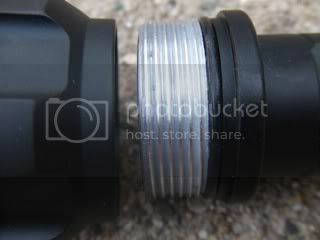 You can also see a small hole to attach a lanyard in one of the corners. Because of the cutout design, a lanyard should not affect it's ability to tail stand. The switch is a reverse-clicky, which means when you push it in, the light will not turn on until you let it come back out. This is a more robust design, but it means no momentary on. Finally, you can notice that the head of the light has some nice cooling fins to help dissipate heat when the light is run on high for a while. 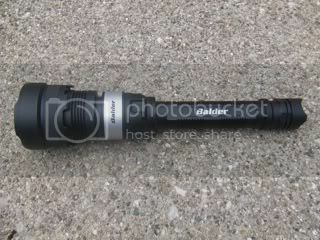 Even so, like with most lights, I'd recommend switching to a lower mode when you feel the light start to get hot. This light has a "basic" UI and a "hidden" UI. Basic: High, Medium, Low; with mode memory after 2 seconds of the light being off. When you turn the light on, it will come on in the same mode that you last used. From there, either turning the light on and off (within two seconds) or doing a "half-press" will advance the light to the next mode. When you leave the light off for two seconds, the mode memory kicks in and it will remember that mode for the next time you turn it on. 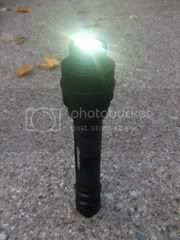 Hidden: Strobe, Alarm, SOS, High, Medium, Low; with mode memory after 2 seconds of light being off. To access the "hidden" modes, cycle through the basic modes until you get to low. 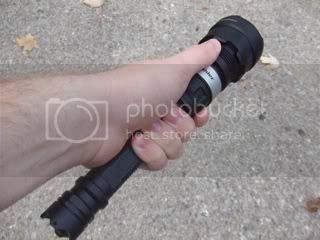 After 5 seconds the light will do a quick flicker off then back on. When it does that, turn the light off, wait at least two seconds, then turn the light back on. 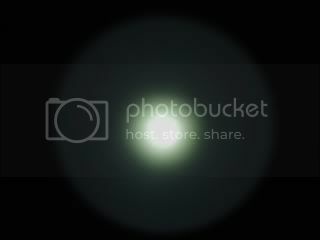 You now have access to a constant strobe, "alarm" (the light will strobe for a few seconds, then go off, then strobe for a few seconds again, etc. ), and SOS (in morse code). To get back to the basic UI, do the same thing you did to get to the hidden UI. Here's a video showing the hidden modes, so you can get an idea of the speed of the strobe, etc. 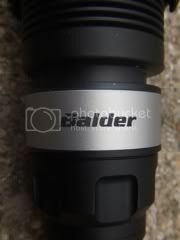 This is a large light, and the button is on the tail cap, so if you want to carry it and have it feel well balanced, you'll have to shift to a grip nearer the head after you turn the light on. These beam shots are taken on a white wall with my camera set at ISO 100, f/8, 1/2 second exposure. As you can see, the BD-4 has a tight spot with very even spill. My camera was set on auto white balance, but you can still see that the low mode is slightly yellow-greenish and the high mode is slightly purplish. Is it too much to ask for a neutral U2 binned XM-L? And, here it is in candle mode. If you use candle mode in a room at night, it gives the room a noticeably pink-purple tint. 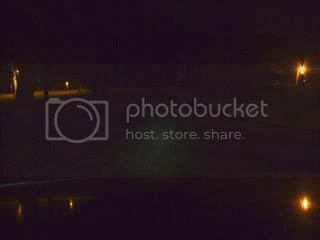 And the outdoor shots (I apologize for the poor quality pictures, I don't have a very good camera). More outdoor shots to come if I can find a friend with a better camera. 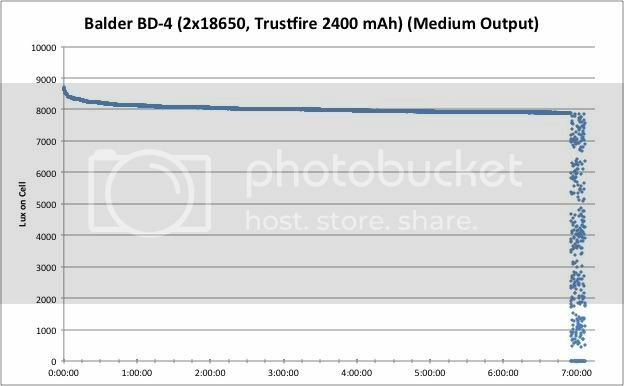 The runtime charts below are done with 2x18650 Trustfire 2400 mAh cells. 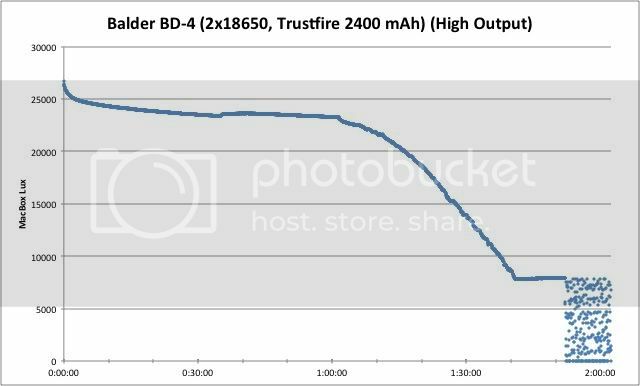 They are "cheap 18650 protected batteries." The instructions say the cells need to be able to discharge at more the 2 A, and in other lights these have successfully discharged at 2.8 A with no problems. When the protection is about to kick in, the BD-4 starts blinking as a low battery warning (seen on the graphs as a bunch of scattered dots). Note: The vertical axis of these charts represents a relative brightness measurement using a home made light box. The horizontal axis is time in hours:minutes:seconds. Notes: I ran the test on low twice, because the specs claimed 180 hours on low. Both times it clocked in at around 50 hours. Also, my equipment didn't record and blinking at the end of the low mode, or even any dimming, so it looks like the light just shuts off. 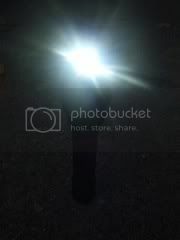 This is a great light overall. 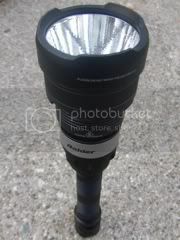 The large, deep reflector makes it great for outdoors, and the ability to remove the head for candle mode keeps it from being completely useless indoors . 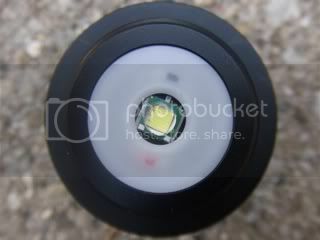 The choice of U2 binned LED sets it apart from many other high-end LED lights. -Candle mode is fun, what a candle! A note on the hidden modes. When I first fired up this light, I purposefully didn't read the instructions on how to operate it. 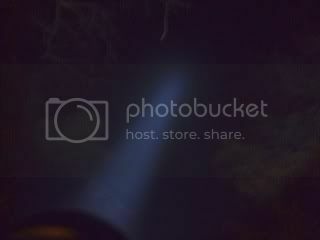 After using it for a while, I found myself in the strobe modes on accident (that was quite a shock!). I then could cycle through both the hidden and regular modes, but I didn't know how to turn the hidden modes off. I know that a lot of people like blinky modes, but personally I'm not a big fan of them. When I first turned it on to strobe, it startled me when I expected low. Not knowing how to get them to turn back off was irritating. After reading the instructions, I was able to get out of the hidden modes and it hasn't been a problem since then. However, if you lend the light to a friend, you might want to warn them. Blinky modes are tough to implement into a UI, because if the user wants them on the light at all, they want them easy to access quickly when they are needed, but they don't want to activate them on accident or have to move through them to get to another mode. Balder's implementation of blinky modes in the BD-4 is much better than having them be part of the regular sequence, but is still not ideal. Honestly, I haven't seen any lights that implement these well using only a single switch turning on and off to interface with the light. 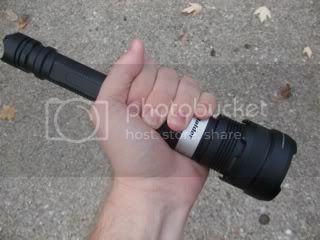 Another note, this is a light that needs a holster. It won't fit in my pocket, and I have big pockets. No holster was provided by Balder for review, but I understand they are an "optional accessory," so I would recommend option for this accessory if you order the BD-4. The BD-4 can out-throw my car's headlights. They aren't particular great headlights, but I was impressed. 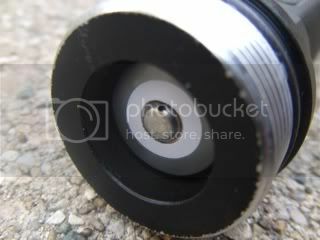 If you need a thrower, this would be a great choice for a great price. The only thing I would ask to make this a better thrower would be a smooth reflector instead of OP. The OP texture makes the beam look nice on a white wall, but when I'm outside using this light I want every bit of throw I can crank out of it, and for that, I want a smooth reflector. 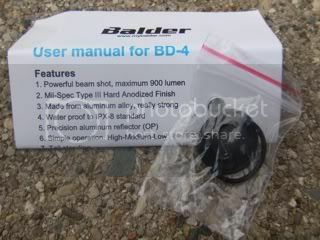 Thankfully, the texture on the BD-4 reflector is very light, so not much throw is lost. The BD-4 is intimidating. When it's turned off, people will see a serious piece of equipment. When it's turned on, people you point it at won't see much at all, but you will. For those of you who like the strobe mode available to disorient attackers, I would recommend going ahead and activating the hidden modes, and leaving them activated. In the event of an assailant approaching you, you won't have time to cycle to low, wait 5 seconds, turn the light off, wait 2 seconds, then cycling to strobe. 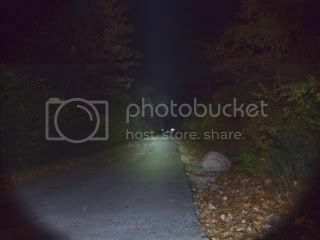 Ideally, strobe mode on a light would be hidden but then easily accesible when you need it quickly. I like the way my V20C does this, because you turn a control ring to control output, with detents at off and max, but you can turn it past the detent at max to activate strobe. Like I said, I don't know of any way to do this with a single switch, and Balder has implemented a UI that is about as good as it can get. 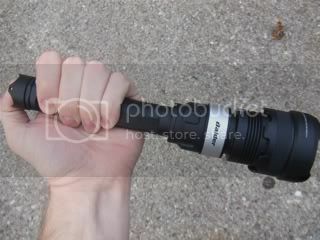 I don't really like the idea of using a flashlight as an impact weapon (surely you have something better within reach? 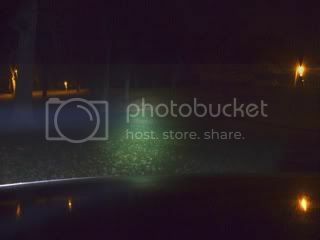 ), but in a pinch, you could defend yourself with the aggressive rear end of this light. The Bd-4 does not fit in my glove box. Luckily, it fits under my seat in my car just fine, so it's within reach when I need some bright light that I can quickly aim. 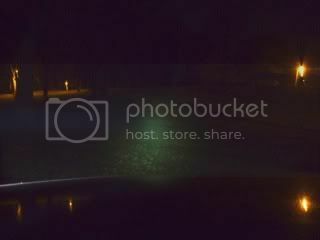 As I mentioned, this light out-throws my car's headlights (though without as much flood) so it's nice to have around. At first, when reading the specs, I was worried this was an 18650 only light, which in my mind would disqualify it from being kept in the car. However, after Balder confirmed that it can accept 4xCR123 just fine, I feel comfortable loading it with lithium primaries and leaving it in my car for an indefinite period of time. 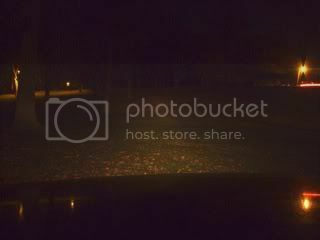 The only drawback is that for a light this fun, I don't really want to leave it in my car, I want to have it with me. Very nice review Bigmac! Thanks so much for your time and effort on this! Wow! 3rd review today! Thanks yet again Bigmac! Thanks for such detailed reviews + pics! thanks for sharing,the pictures are very good! Nice review…did I miss where you got it and the price? This is copied from the first post. Thanks to Martin at Balder for providing the BD-4 for review.